Pasta (Italian pasta, from Latin pasta "dough, pastry cake") is a generic term for foods made from an unleavened dough of flour and water, and sometimes a combination of egg and flour. 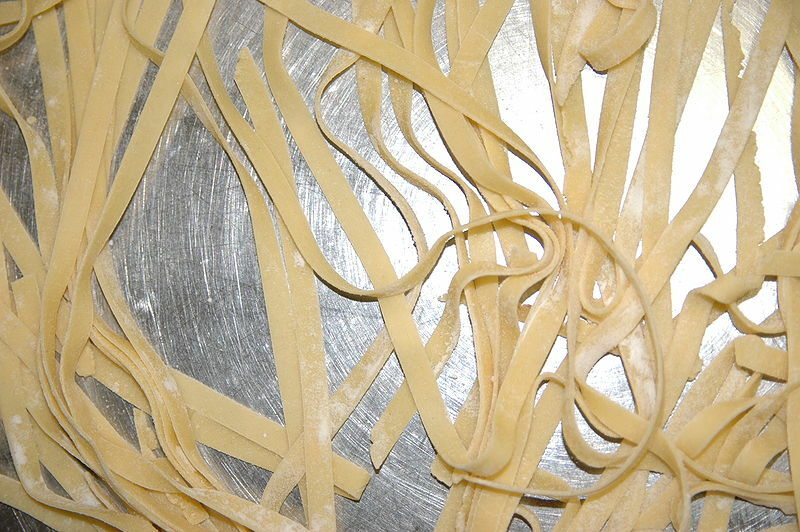 Pastas include noodles in various lengths, widths and shapes, and varieties that are filled with other ingredients like ravioli and tortellini. 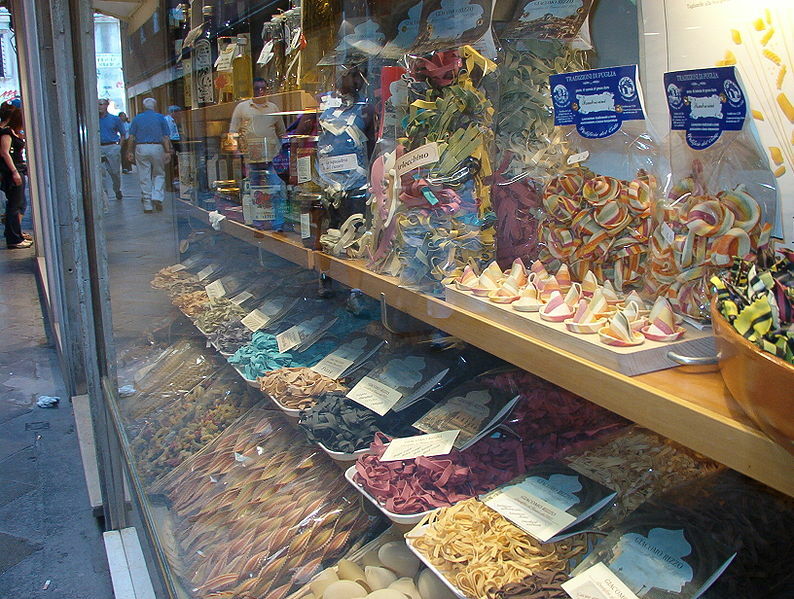 Left: Display window with pasta. The word pasta is also used to refer to dishes in which pasta products are a primary ingredient. It is usually served with sauce. There are approximately 600 different shapes of pasta. 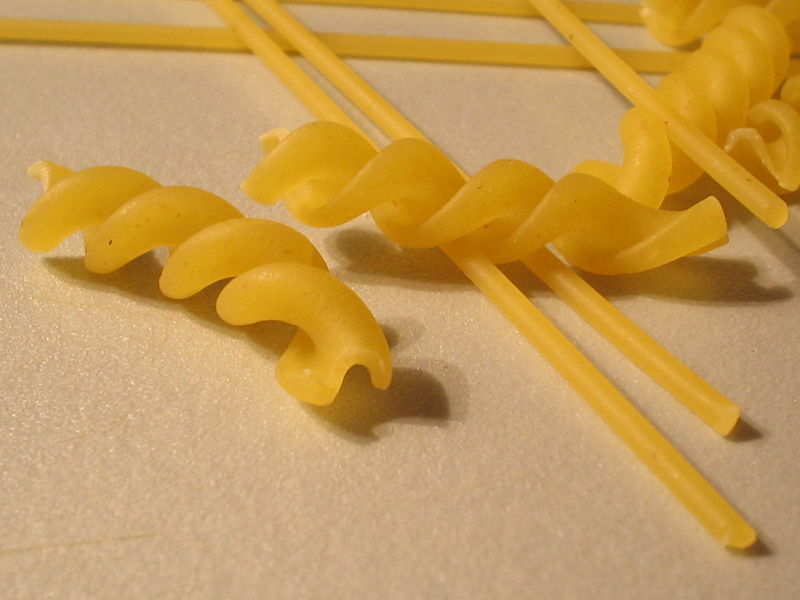 Examples include spaghetti (thin rods), maccheroni (tubes or cylinders), fusilli (swirls), and lasagne (sheets). Two other noodles, gnocchi and spätzle, are sometimes considered pasta. They are both traditional in parts of Italy. Left: Dried pasta varieties: spaghetti and fusilli. Under Italian law, dry pasta (pasta secca) can only be made from durum wheat flour or durum wheat semolina. Durum flour and durum semolina have a yellow tinge in color. Italian pasta is traditionally cooked al dente (Italian: "firm to the bite", meaning not too soft). Outside Italy, dry pasta is frequently made from other types of flour (such as wheat flour), but this yields a softer product that cannot be cooked al dente. There are many types of wheat flour with varying gluten and protein depending on variety of grain used. Fresh pasta may include eggs (pasta all'uovo 'egg pasta'). Whole wheat pasta has become increasingly popular because of its perceived health benefits. Most whole wheat pastas have a mixture of whole grain and regular grain ingredients. Pasta is generally served with some type of sauce; the sauce and the type of pasta are usually matched based on consistency, ease of eating etc. 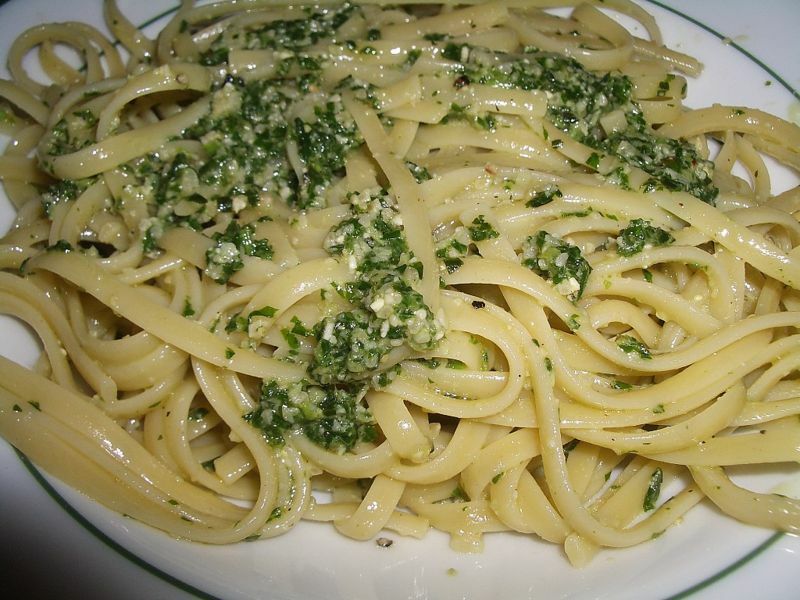 Common pasta sauces in Northern Italy include pesto and ragù alla bolognese, which usually adds meat to the sauce. In Central Italy, there are simple sauces such as tomato sauce, amatriciana and carbonara. Southern Italian sauces include spicy tomato, garlic, and olive oil, with the pasta often paired with fresh vegetables or seafood.